Check out these rocking nails from the 2018 Grammy Awards red carpet. Celebrity nail tech Tom Bachik did presenter Hailee Steinfeld's nails using OPI Do You Take Lei Away and OPI Chrome Powder Effects in Pay Me in Rubies. Bachik used OPI's Feeling Frisco and Samoan Sand on Heidi Klum. Maria Salandra gave Rihanna a dramtic nail look using OPI It's a Piazza Cake and OPI Chrome Powder Effects in Great Copper-Tunity. Naomi Yasuda provided Lady Gaga with two nail looks for the Grammys. For the star's red carpet nail design, Yasuda drew inspiration from Lady Gaga’s lace embellished bodysuit and extravagant wrap-around skirt, creating a deep, romantic manicure using Red Carpet Manicure in Black Stretch Limo. For her performance, Yasuda created a soft, angelic look to match Gaga's outfit using Red Carpet Manicure in Silk Slip. Using Red Carpet Manicure's Candid Moment, Lisa Logan gave Pink a minimalist manicure that complemented both the singer's colorful, bold red carpet dress and the low-key white t-shirt and jeans she wore during her performance. Janelle Monae wore a dark red metallic look. Cardi B wore long, pale pink stilettos with blingy embellishments provided by manicurist Jenny Bui. Camila Cabello's red nails (Deborah Lippmann in Lady Is a Tramp) complemented her gown. 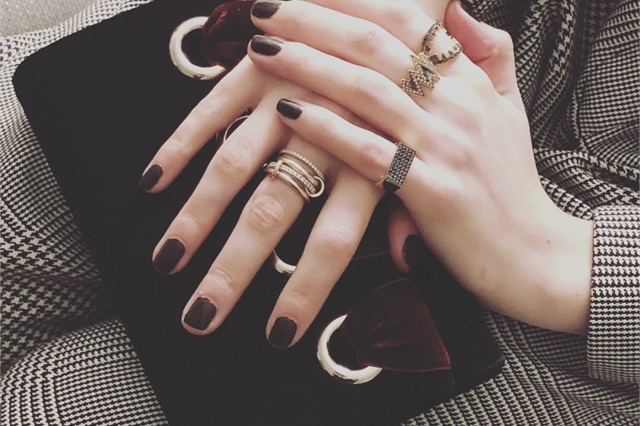 Anna Kendrick wore Deborah Lippmann polish in Red Red Wine.